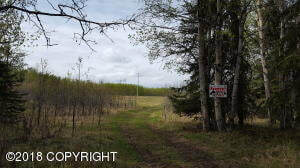 DESCRIPTION: 40 acres with a beautiful mountain view that would be perfect for a farm or horse property. There is an old hay field on the property and a high voltage power line that runs through the property, there is also residential electric across the lot. DRIVING DIRECTIONS: Funny River Road to MP 14. Turn on Rabbit Run Road, then turn right on Kanak Avenue. Look for real estate sign.